For many years, Ushio air grinders have been the grinder of choice for tool rooms, deburring benches, and model shops. 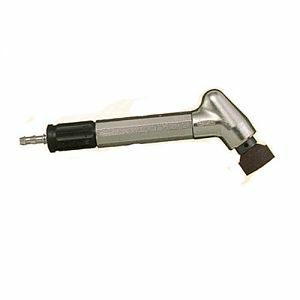 This slim, pencil-shaped air grinder has a lot of power and air exhausts thru the rear overhose. The uniquely slim design of this 45° angled head allows users to reach areas otherwise inaccessible with other angled grinders. The MAG-122N is suitable for surface grinding in small tight areas with a 20mm cup grinding wheel as shown. Additional cup wheels available in 60 or 100 grit.